The role of higher education in improving K–12 education. It presents quantitative and qualitative studies that investigate the impact of dual enrollment programs on student and faculty participants. Accounts by dual enrollment program administrators provide examples of how their programs operate and how data have been used to set benchmarks for program success. Chapters also explore models that build off dual enrollment’s philosophy of school–college partnerships and embrace a more robust framework for supporting college transition. This is the 158th volume of this Jossey–Bass series. Addressed to higher education decision makers on all kinds of campuses, New Directions for Higher Education provides timely information and authoritative advice about major issues and administrative problems confronting every institution. 1. Why Dual Enrollment? 1Eric HofmannThis chapter outlines the contents of this volume and presents an overview of dual enrollment within the context of a national collegecompletion agenda. 2. Does Dual Enrollment Increase Students′ Success in College? Evidence from a Quasi–Experimental Analysis of Dual Enrollment in New York City 11Drew Allen, Mina DadgarResearchers review studies on dual enrollment and postsecondary achievement and highlight their recent analysis of New York City′s College Now program. 3. "I don′t know, I′ve never been to college!" Dual Enrollment as a College Readiness Strategy 21Melinda Mechur KarpThis chapter uses student interviews and a theoretical framework of anticipatory socialization and role rehearsal to understand the impact of dual enrollment on students who participate. 4. Teaching and Learning in the Dual Enrollment Classroom 29Katherine L. Hughes, Linsey EdwardsResearchers use qualitative data from California′s Concurrent Courses Initiative to understand the impact of dual enrollment programs on pedagogical strategies. 5. The Impact of Dual Enrollment on the Institution 39Katherine N. KinnickThe director of a dual enrollment honors program discusses the value of dual enrollment programs to universities while highlighting programmatic concerns and challenges. 6. Data–Informed Practices in an Urban Dual Enrollment Program 49Jeanette KimThis chapter describes how data inform program priorities and benchmarks for success in a systemwide dual enrollment program in New York City. 7. Dual Enrollment in the Broader Context of College–Level High School Programs 59Kristin Klopfenstein, Kit LivelyThis chapter provides an overview of some differences between dual enrollment and Advanced Placement programs, including their origins, the curriculum, and impact on postsecondary achievement. 8. Using College Placement Exams as Early Signals of College Readiness: An Examination of California′s Early Assessment Program and New York’s At Home in College Program 71Andrea Venezia, Daniel VolochThis chapter explores the use of college placement exams and specially designed courses in order to improve alignment between secondary and postsecondary institutions. 9. Early Colleges: A New Model of Schooling Focusing on College Readiness 81Julie A. EdmundsThis chapter presents quantitative and qualitative data from an experimental study of early college high schools in North Carolina, as well as an overview of national studies of early colleges. 10. Dual Enrollment Lessons and the Development of The New Community College at CUNY 91Tracy MeadeThe former project director discusses the influence of dual enrollment programs on the planning of a new community college. 11. 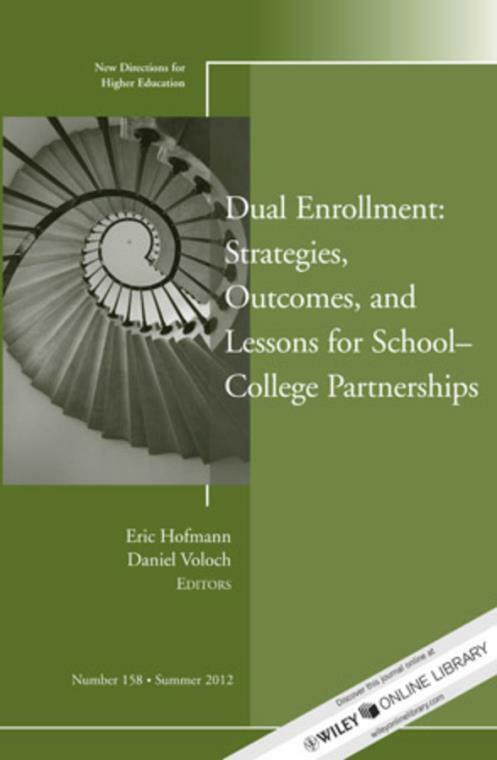 Dual Enrollment as a Liminal Space 101Eric Hofmann, Daniel VolochThe authors propose a new metaphor for thinking about dual enrollment programs as a strategy to support successful college transition.